Notes: Based on the light novel series written by Nisio Isin and illustrated by Vokan. Although the first book was called Bakemonogatari, later books in the series are called different names. The first 12 episodes of the series aired on T.V., while the other 3 were released as web episodes on SHAFT'S website. The TV edit of this series is notorious for being incomplete. This is especially noticeable in episode 10, which has a ton of still shots, as well as scenes where only the voices and music can be heard. The DVD/Blu-Ray version is more complete, featuring fuller animation, as well as correcting animation errors from the original broadcast. This review is extremely out of date and the reviewer hasn't watched this series in years, or has plans to continue it. Koyomi Araragi is a third-year high school student who survived a vampire attack and is now almost human again. He has the ability to sense supernatural beings, including gods, ghosts, spirits, and mythological spirits. 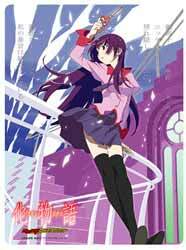 One particular encounter finds himself entangled with a strange, sharp-tounged girl named Hitagi Senjogahara, a girl who two years ago was attacked by a crab spirit and has lost a lot of weight. She keeps this a secret and threatens anyone who finds out. Koyomi finds out, offering to help the girl out. With help from a friend of his, Hitagi eventually confronts the crab and regains her lost weight. Hitagi later opens up to Koyomi for helping her, if but a little. The rest of the series deals with Koyomi (and sometimes Hitagi) meeting girls who have been affected by various spirits, including snakes, monkeys, and cats. Bakemonogatari is quite the departure from the usual SHAFT series. It's the most episodic of their works, and at times plays out more like Kyoto Animation's Key / Visual Art's series than their usual slice-of-life series. One thing they didn't lose, though, was their stylized art. The coloring and background often matches the atmosphere, and the backgrounds never get too cluttered to get in the way of things. There are some particularly good pieces of art at times, especially when Koyomi and Hitagi walk around their town. The animation isn't typically busy, but when the time comes for something to be animated, it's animated well. The music uses quite a bit of range of moods and feelings, and each girl's arc even has its own opening theme sung by the voice actress of that arc! The voice acting is a mishmash of tried-and-true voice actors from previous SHAFT series, as well as people new to the company. But enough about the artistic and audio elements of the series. Let's talk about the show itself. Bakemonogatari is based on a light novel series. Typically this is enough for me to lose interest in an anime, as light novel adaptations have become so common a sight for me it's hard for me to care about them. Fortunately, the series makes up for it with some of the wittiest, interesting, and at times funniest dialogue I've seen in an anime in a while. By the end of Hitagi's arc, I was sold on this series. Each girl Koyomi bumps into has a different problem/situation, and it's Koyomi's job to help them. Some of them are simple enough at first (tomboy with a wrapped-up hand that holds secrets, young girl trying to get home), but the goals to these problems are not nearly as cut and dry as they seem. And unlike a lot of series that have arcs for its heroines, where the character of the arc is typically abandoned when their arc is over, the girls in Bakemonogatari actually make quite a few appearances in the series. This gives the series a more connected feel, making its cast feel more like a whole than a series of somewhat related vignettes like a lot of visual novel / dating sim anime are. Koyomi is sort of like the Kyon to Hitagi's Haruhi Suzumiya: the "straight man" in the series. But even though he's the one helping others, he's not free of his own demons. He has his own problems to deal with, and while he's happy to help out being with spiritual problems, he's not always the nicest person in the world to the girls he helps out. A later arc even has Koyomi trying to eliminate an oddity all on his own, but to no avail. And when he and Hitagi start dating later, it opens a level of awkwardness for Koyomi. Hitagi is not your typical heroine in these kind of series. Intelligent, sharp-tongued, calm, and at times remorseless, her character feels more like an antagonist than Koyomi's love interest. Her conversational exchanges with Koyomi often play out like an even more mean-spirited version of The Lockhorns comic strip. And she's not afraid to threaten Koyomi either when he annoys her, though these threats are seldom carried out. There are other girls as well. First up is Mayoi, a temperamental 10 year-old girl trying to find her way home, but is unable to. Next up is Suruga, a girl a year younger than Koyomi and Hitagi, and the latter's basketball teammate. The two have since grown apart, much to her dismay. Third is Nadeko, a sad, young girl who's the same age as Koyomi's twin sisters. There is also Tsubasa, the uptight class president and a friend of Koyomi's who sometimes is seen in the other girls' arcs before appearing in her own much later. She has parental problems, not unlike a lot of other girls of her type in anime. Other characters include Meme, a middle-aged man living in an abandoned building who helps Koyomi and others with their problems (at a pirce); Shinobu, a sad girl who also lives in said building; and Koyomi's twin sisters Karen and Tsukihi, who mainly serve as the narrators for the next episode previews. As much as I liked the writing in Bakemonogatari, I didn't particularly like the actual characters themselves - not even Koyomi. I especially didn't care for Hitagi, whose sharp tongue makes Haruhi Suzumiya sound as sweet and innocent as a pre-school teacher. At first I found her put-downs and sarcastic comments funny, but the longer the series went on, the less amusing I found them. And Tsubasa is just dull - unlike the other girls, who have a certain flair of their own, Tsubasa has nothing. Fan service, although not rampant, hits hard when it does appear, particularly in the arc of 12 year-old Nadeko, where viewers are witnessed to several scenes of her almost-naked body, and Koyomi getting somewhat turned on by it! Can you say "yuck"? But for the all the negativity I give the characters, I do honestly enjoy Bakemonogatari. It's certainly the most interesting of SHAFT's series, and the art and writing alone are gripping enough for me to overlook many of its flaws. It's definitely not a show for everyone, but if you bother to watch the first two episodes, you might find yourself liking one of the most fascinating series to come out of Japan in the year 2009. Recommended Audience: Koyomi bleeds quite often in the series (he quickly recovers due to his vampiric blood, though), and nearly every arc has a few blatant scenes of fan service in them. While the series has quite a few funny moments, it has just as many depressing ones, some of which get quite dark. Parental discretion is advised.